If you think Morocco is one of those countries where transportation and traveling around in general is; a) difficult or b) expensive or c) dangerous, I’m going to stop you right there and tell you you’re incorrect. I’ve traveled across the different corners of this amazing country and taken every form of transportation and it’s incredible how easy, inexpensive and safe my travels have been. I’ve traveled alone across the country multiple times as a Peace Corps volunteer. Imagine traveling across the Sahara Desert and through the Atlas mountains to get to the capital for a total of 19 hours just to get your wisdom teeth pulled…yup I’d that person. 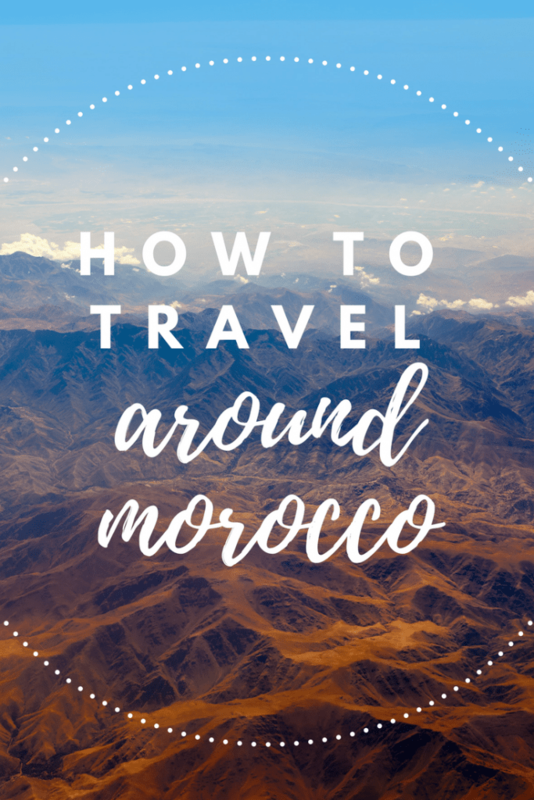 I’ve compiled a list of every public form of getting in and around Moroccan cities so you can be prepared for your own adventures when you’re in Morocco and have some price references handy. I personally love railroad system in Morocco for traveling. In my experience, its’ safe and easy to go from across far distances in the country. The ONCF website (national rail line) is all in French but it’s still pretty easy to navigate for the non-Francophones among us, myself included. It connects all the major cities (Casablanca, Rabat, Fes, Meknes, Marrakesh) along with smaller towns in between. Marrakech is its’ last stop going south but the Marrakech station is conveniently located next to two major bus companies (SupraTours & CTM). As ONCF is affiliated with SupraTours if you were looking to continue traveling south past Marrakech, you can look up on their “Horaires” section locations like Zagora or Dakhla so you can plan accordingly and purchase a combined train-bus ticket from any train station. At this time you can not purchase train tickets online but can do so at any train station across the country. A coach class/2nd class train ticket can range from 30 dirham between Rabat and Casablanca (1hour distance) to as much as 628 dirham if you were to travel from Mohammed 5th Airport in Casablanca to the far south of Dakhla. For medium distances it’s safe to say you’d be in the mid-price range for travel that’s not more than a few hours so around 100-150 dirhams. These two bus companies are the most reliable and comfortable bus companies with extensive routes all over the country. On the CTM website you can actually change the language to English and you can also purchase your ticket online or in a given station. Just like the railroad these two bus companies travel to the majority of cities and bigger towns across the country. Some of these buses come with WIFI and some extra leg room if you take the “Luxe” buses. Pricing for both companies is similar. For example, Casablanca to Marrakech is about 85 dirham while Marrakech to Zagora about 135 dirham. Standard buses, available at what I affectionately call the souq bus station, are the most affordable bus you can take across the country. However, each bus is privately owned by an individual company and the times they advertise to leave the station and arrive at your destination aren’t always accurate. Actually, they’re usually never accurate as these buses make many stops along the way to pick up and drop off passengers. While it varies from bus to bus often times the conditions of the buses aren’t in tip-top shape. Animals are also allowed on which if you have a dog is great for you since the other forms of transport will forbid it. But your fellow passengers will probably not be thrilled to see a dog next to their chickens. In terms of safety and security, I don’t think these are as safe as CTM or SupraTours because of how often they stop, and how they can pick up anyone from off the road. Also, when buying tickets for these buses you will find most will be speaking in Darija and possibly some French and English – in other words expect a language barrier. Pricing is usually much lower than CTM or SupraTours but is determined by the individual company for a particular line. For example, one bus might cost 60 dirham from Marrakech to Casablanca but another could charge 70 dirham and leave the station at a different time from the first. A very traditional way of getting around from city to city or from a city to towns and/or villages is to hop in a Grand Taxi. To spot one, they’re always yellow and have a red circular stamp that says “Grand Taxi” on the bottom part of the emblem. Usually they sit either 6 or 8 people depending on the model of the car. If you think riding on the NYC subway train during rush hour is packed, you’ll get deja ju with these. Often these are regular four seat cars in which an additional two people will squeeze in to use up all available space. If you’re traveling with a group of 5 or 6 this is a great way to save money traveling far distances, or if you want to leave at a particular time where the train or buses don’t run. For short distances, such as small villages connecting to the larger town or city nearby, it’s often very affordable as low as 5, 10 or 15 dirham per seat. However, sometimes you will have to haggle a price down if you hear a very high price. For example, compare the price of the local bus station to see if it’s more than the bus. If it is, it’s not a good deal. If the distance is about 20kms or less, I wouldn’t pay more than 10 dirham. For long distances – for example traveling from Zagora to Ouarzazate, expect to pay about 80-90 dirham for the 3 hours ride. The prices double after sunset so a 10 dirham ride in the day becomes 20 dirham at night. Tipping is usually not expected or required. However, some grand taxi drivers have had experience receiving tips from foreign patrons so they might ask you for a tip. Petite taxis are only found within city limits. Their color is uniform to the city that they’re in, so in Rabat they are usually blue, in Fes they are green, and in Marrakech they are yellow. The taxis can seat 4 people but Moroccan law says they can only include 3 passengers. Also, they run on a meter price based on distance. A minimum ride is 7 dirham in the day and 10 dirham at night. Often, you’ll experience some not-so-lovely taxi drivers who will ask you “How much do you pay?” or just tell you a set price of their choice when you tell them where you want to go. I recommend if they won’t turn on the meter, look for another taxi because they are most likely trying to scam you for more money. Read our post on taxi scams to find out more. Tipping is the same as with grand taxis. Not many places have a tramway, just Casablanca and Rabat. These new, modern forms of transportation make getting around the center of both cities quick and efficient. You can buy a one way tram ticket at any station for just 6 dirham***. Some stations have a tram worker in a ticket booth who will usually speak Darija or French but sometimes you can find an English speaker as well. Otherwise, you can purchase your ticket(s) from the machine. If you want to get around in either of these cities the tram is a very simple and convenient way to do so. Motorbike and pedal bike rentals are becoming more popular in cities across Morocco. You can hire pedal bikes for a day or several days and use them to get around or go on special biking tours organized around the country. Motorbikes are also available for rent by the hour or day. It’s advisable that you only consider this if you are an excellent driver. Moroccan roads can be a quagmire and you will quickly find bike riding in Marrakech is very different than bike riding in Copenhagen! Prices will vary depending on where you are, length of time, and equipment. It is possible to self drive during your vacation in Morocco. But do so with caution. Car rentals are available at all airports across the country as well as private car rental companies. There is typically a very large deposit required when you initially hire the car and it’s very important to document any and all damage to the car before leaving the parking lot. Damage such as scratches, dents and chips are very common to vehicles in Morocco due to the nature of conditions. So if you’re planning to go to the mountains where you’ll be driving on tougher terrain make sure you understand what the policy of the rental company is when it comes to damage. Document everything. Take a video of the exterior and interior of the vehicle when you pick it up so that you have proof of condition and don’t get home to discover they’ve charged you for things that you were not at fault for. If you like traveling alone this can be easy however budget in plenty of time for pick up and drop off. One of the best ways to see cities in Morocco is by foot. It’s also sometimes the only way. The old part of Moroccan cities (the medinas) were not built for cars. It’s impossible to drive in many of them because the streets are too narrow or because it’s forbidden. This is where you’ll need to rely on your feet. If you have difficulty walking you will want to take care to consider all of your destinations and choose where you will stay as well as what you will do based on how mobile you are. 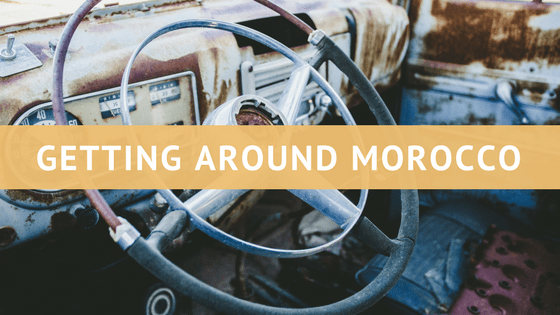 We hope this helps you uncover the best ways for you to get around in Morocco! Yikes! Is it true that it’s not possible to bring a small carry-on with a little dog on for example a Supratours bus? and not even the train? What about if one paid for an extra seat to place the small carry-on bag there? Tell me it isn’t true! Hi! You forget to mention hitch hiking. Ive been traveling since a year in Morocco. And hitch hiking goes amazingly easy. And ive met some interesting and the most kind people. Not to forget to mention im female and traveling alone. Which is great! Glad it’s worked for you. I would never personally advocate for this as an option but I know people do. Hello ! 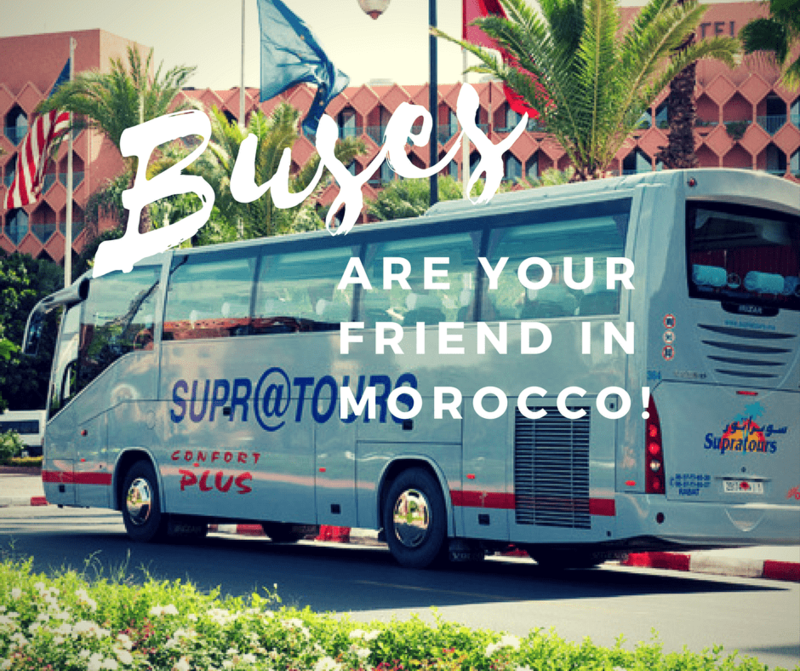 There is a good web site that I have already tried and I recommend for booking your bus tickets online in Morocco, it’s called http://www.bybus.ma, it allows you to compare the offers of transporters and to book your tickets online, cheaper, simple and fast.